If the whites in Quebec who are donning blackface are claiming to have no prior knowledge of the practice, how and why exactly are they coming to partake so frequently in its disturbing revival? Are some commentators then claiming that some white people are born with an inherent desire to spontaneously paint their faces black to stereotype, dehumanize, and ridicule the physical characteristics of their fellow citizens? Most people are intelligent enough to deduce that blackface is a popular form that you no longer tend to see on TV or in film anymore for a reason. Mario Jean's blackface "impersonation" of Boucar Diouf at the Gala des Oliviers (Radio Canada, 12 May 2013), has sparked problematic responses in La Presse and Metro. Besides factual errors, the responses seemed designed to reconfigure centuries of homegrown Canadian and Quebec racism as American problems. Am I surprised? Not at all! I just taught a course on Canadian Slavery. All of my Canadian students started the course with something in common -- zero knowledge that slavery had occurred in Canada. Slavery was practiced in Canada (by the French and the British) for over two centuries. Unlike other empires, the French enslaved both Natives and Africans in what is now Quebec. Marcel Trudel's Dictionnaire des Esclaves et de leurs Propriétaires au Canada Français (1990), gives a detailed picture of the white men and women who owned slaves including clergy, merchants and soldiers. Although ignorant about Canadian slavery, my students had been schooled from a young age in the Underground Railroad, which positioned white Canadians as liberators of African-American slaves. By the way, the Underground Railroad lasted from 1834 until 1865. Is something off here? How is it that we Canadians all seem to know about a three-decade window when enslaved Africans fled north from the U.S.A., but we know nothing about a two hundred plus year expanse of time when we too were slaving? As the common expression goes, the victors write history. Canada's central role in the Trans-Atlantic World of slavery and colonial commerce was quickly replaced by a slavery-never-happened-here myth. But luckily for truth-seekers, slavers weren't shy about their activities. Rather, they proudly documented and archived all manner of art and material culture, which clearly reveals every sordid detail of their systemic oppression and exploitation of the black and indigenous populations that they enslaved and displaced. In more recent times, scholars like Trudel, James Walker, George Elliott Clarke, Maureen Elgersman, Afua Cooper, Karolyn Frost, Frank Mackey, Joseph Mensah, and myself have revisited these archives publishing books and other research. Several authors who have been defending the use of blackface are ignorant of this literature, as well as the literature surrounding blackface minstrelsy. Some authors have even gone so far as to contend that they have never heard of blackface. What I would find more plausible is that they did not know its specific histories or why it is so offensive to the vast majority of black people. Most Montrealers can recall the furor over the use of blackface during Frosh Week by white students at HEC in 2011. The students who donned blackface and the Jamaican national colours, chanted about marijuana smoking, and carried stuffed monkeys. Once caught, they claimed that they were celebrating the Jamaican Olympian Usain Bolt. I can tell you right now that many, if not most, blacks didn't buy it! But if the whites in Quebec who are donning blackface are claiming to have no prior knowledge of the practice, how and why exactly are they coming to partake so frequently in its disturbing revival? Are some commentators then claiming that some white people are born with an inherent desire to spontaneously paint their faces black to stereotype, dehumanize and ridicule the physical characteristics of their fellow citizens? 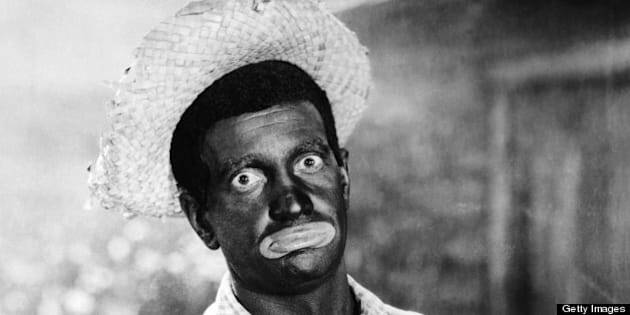 Most people are intelligent enough to deduce that blackface is a popular form that you no longer tend to see on TV or in film anymore for a reason; that is, our society has progressed to the point of holding a majority consensus that it should be banned. But Canadian ignorance extends beyond slavery to false claims that blackface minstrelsy has nothing to do with Quebec. Well, the holdings at the McCord Museum, Montreal reveal otherwise. The museum holds a large stash of broadsheets, photography, advertisements, and other paraphernalia of Canadian minstrel troupes that performed in Canada in blackface throughout the nineteenth and twentieth centuries. Just as Canada's history of slaving has been suppressed, so too has the role of white Canadians in the creation and promulgation of blackface minstrelsy been conveniently forgotten. Blackface minstrelsy was a popular, nostalgic site through which whites lamented the end of slavery using dark "humour" delivered in song, dance, and jokes that celebrated white fantasies of violence against black bodies. As such, for many blacks it is a disturbing reminder of the heinousness of slavery and a symbol of anti-black racism. It saddens me that Diouf is allegedly defending Jean's use of blackface. But it does not surprise me. As one of the few black comedians in the Quebec scene, he is in a difficult position. But what becomes of the next generation of black Quebecois comedians who feel as if they have to "toe the line" and similarly go along with their racist caricaturing in order to "fit in" and gain space in the racially homogenous industry. The footage of the Gala is immediately striking for the pervasive whiteness of the audience, presenters, and awardees. In this sense, I feel that a comparison with the U.S.A. would prove fruitful for journalists covering Quebec culture. Upon entering the racist U.S. film industry in the 1950s, icons like Sidney Poitier and Harry Belafonte strategically turned down roles that they knew did a disservice to their fellow black citizens. Their resistance paved the way for the Denzel Washintgons, Jamie Foxxs, and Will Smiths that we now see in diverse Hollywood film roles. For change to occur, brave people need to take a stand and speak up about injustice. Recalling our colonial histories and challenging the disturbing re-emergence of blackface is not "Quebec Bashing." Is that where we are in 2013? Does being a "true Quebecois" imply complicity in the silence surrounding Quebec's colonial histories and contemporary forms and practices of racism? As a nation we have much to learn about our histories. I applaud Nydia Dauphin, Anthony Morgan, and others for speaking out against this racist practice that was supposedly put to bed in the 1960s (at least in the U.S.A.).